Hey everyone! Does warm and humid weather put you in a tropical mood? It sure did for me! 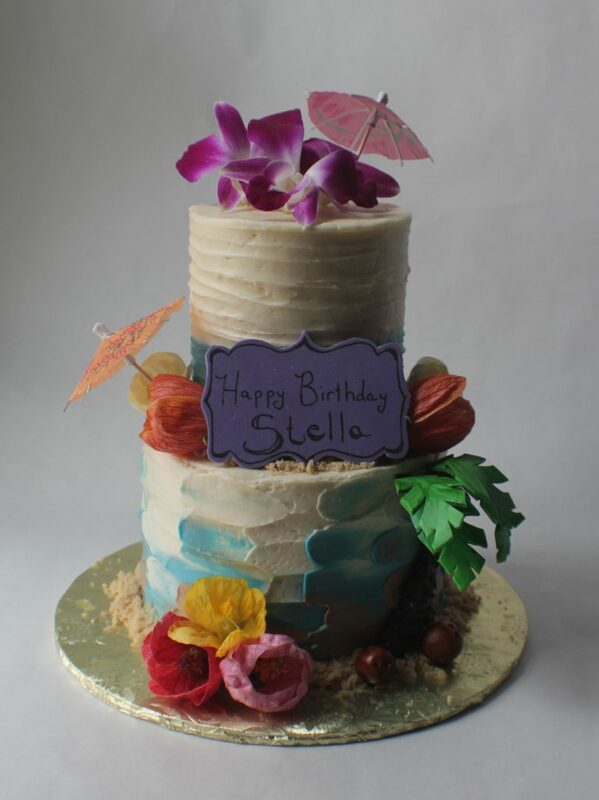 And I was all about this tropical theme birthday cake. Or, more accurately, cakes! I had the pleasure of making not one, but two birthday cakes for two extra special, much loved twin girls. And when you are twins turning five having everything the same is very important. 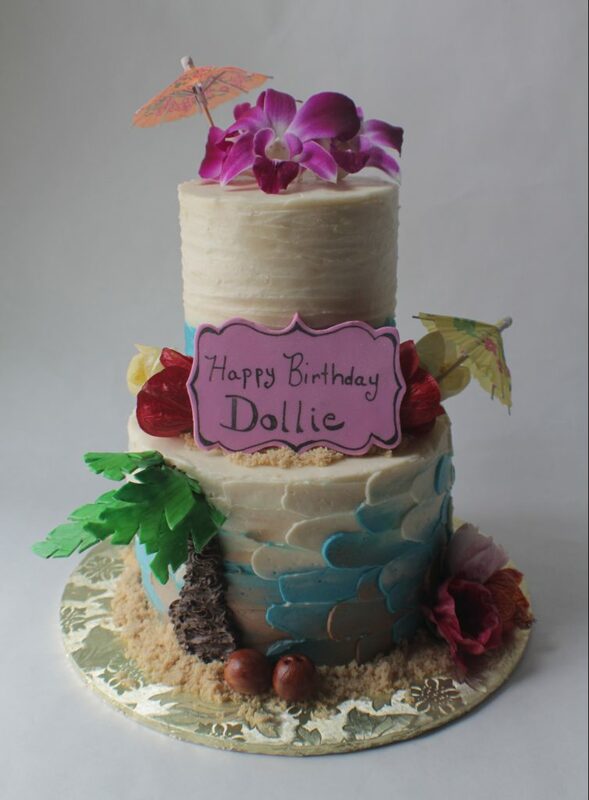 I loved making the tropical theme birthday cake and topping them with those tiny tiers. And having fun with the frosting… who doesn’t like frosting? But honestly, my favorite parts were coming up with all the edible decorations using homemade fondant and completely edible flowers. All except for the little umbrellas — they are just classic/stereotypical paper umbrellas– just perfect, if you ask me. I knew I wanted to have a coconut palm tree on the cake but I really wanted it to have some depth. The idea of palm leaves waving in the ocean swept breeze kept coming to mind. Using homemade fondant colored green and a little palm leaf template I drew up, I set about cutting out eight palm leaves, four for each cake. I shaped them a bit and left them to dry. For the coconuts, I made some bowling ball shapes. Lastly, I cut out a little birthday plaque for each cake, again made from fondant. The flowers. My extra favorite part! 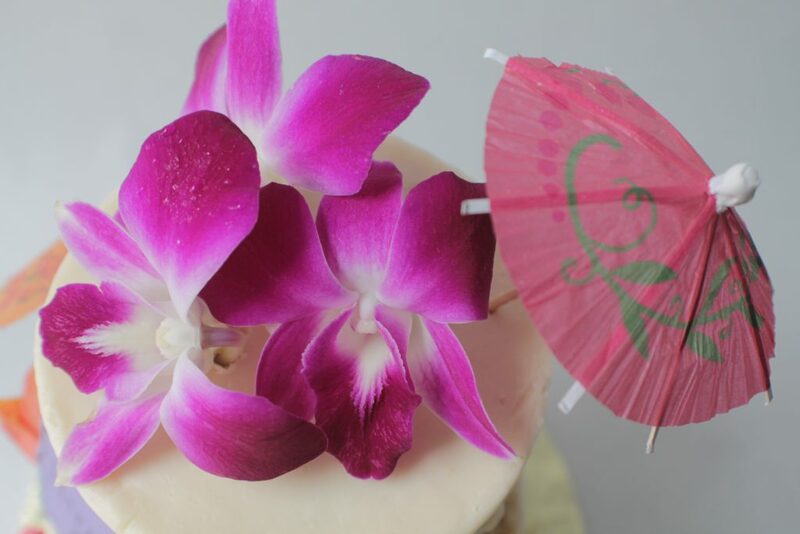 What flowers do you think of when you hear the word “tropical? Immediately, I think of hibiscus and orchids. Okay. I also think of bougainvillea; edible but not an option. I ordered organic and pesticide-free multi-color hibiscus and the fantastically bright pinkish-purple orchids. When the flowers arrived I could hardly contain my excitement! Opening the box and removing two clear plastic clam-shells full of vibrant and exquisite flowers was the highlight of my week. If you could have seen me smiling – my grin was easily from ear to ear. Interested in your own custom designed cake? 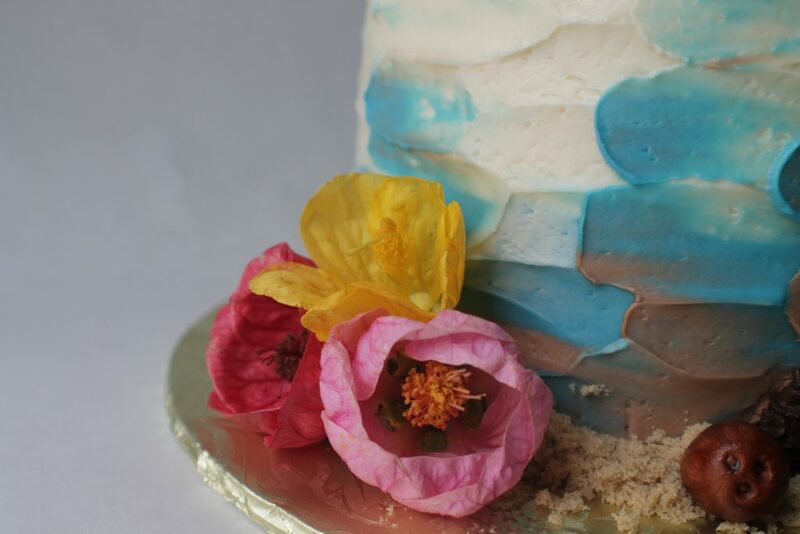 Look through The Gallery and current cake flavors on Our Menu. Hope to hear from you soon!